Rep. Joel Kitchens led his second listening session of the day on Feb.1 at the Door County Library in Sturgeon Bay. Kitchens also held listening sessions in Kewaunee and Egg Harbor. Seated next to him is legislative staff member Adam Tobias. Photo by Jim Lundstrom. 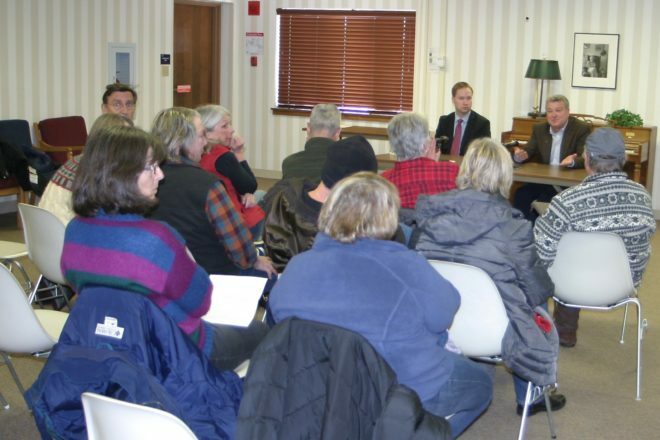 At a noontime listening session held on Feb. 1 at the Door County Library in Sturgeon Bay, Rep. Joel Kitchens was peppered with questions from constituents about the lame-duck session, gerrymandering legislation, gun control and Foxconn. It was the second of three listening sessions he held that day, beginning in the morning in Kewaunee and finishing at the Kress Pavilion in Egg Harbor. Kitchens began the listening session by explaining where the budget process stands. He said Gov. Tony Evers has until the end of February to submit his budget to the Joint Committee on Finance, and then legislators will add their amendments. The first question came from Kent Harrison of Sturgeon Bay [though everyone was asked to give their names before asking a question, not everyone did], who was concerned about the lame-duck session and the negative impression that gave, especially to young voters who might have felt their votes were negated by the GOP tactics. Kitchens said he had to make the choice to either vote against his own party or fight to make the legislation better, but he went on to say that the whole session has not been accurately portrayed. “I know how it was portrayed, and it looked awful,” he said, but he added that much of what took place was simply exerting a balance of power between the legislative and administrative branches of government. Shirley Senarighi of the Door County Civility Project said she was concerned by the timing and process of the lame-duck session, when important legislation was jammed through without adequate hearings and comment. “Because of that, already there’s not a lot of trust with government right now,” she said. “I would like to see some things change that would increase trust levels.” She suggested the Wisconsin legislature could join the approximately 20 other state legislatures that are working with the National Institute for Civil Discourse. Chris Kellems told Kitchens that she had been a lifelong Republican until she watched the lame-duck session. Kitchens pointed out that before former Gov. Scott Walker took office, Democrats held a lame-duck session but were unable to pass legislation to hogtie the incoming Republican. By the time of the late-afternoon session in Egg Harbor, most of the Foxconn questions had become irrelevant with the announcement that the Taiwanese company had taken back a comment made earlier in the week by a company official who said there would be no manufacturing plant built in Wisconsin. After a telephone call between President Donald Trump and company head Terry Gou, Foxconn announced it would manufacture small screens – rather than large television screens – at the plant and would still require 13,000 employees. Kitchens pointed out that Foxconn gets no taxpayer money if it doesn’t hire people. “I think we have enough protections for the taxpayers,” he said. Ron Maloney brought up the question of gun control and asked Kitchens why Wisconsin doesn’t have a waiting period for gun buyers. Maloney pushed back, saying 80 percent of people want more gun control and that gun-death rates are lower in states with more restrictive gun laws. Kitchens said he has not seen that data and added that most guns used in crimes are purchases between individuals. A woman from Sevastopol asked whether Kitchens would be willing to introduce a bill to end political gerrymandering by adopting the Iowa model in which an independent commission draws the lines. “I’m not going to introduce that bill. If it comes before me, I would be supportive of it,” Kitchens said. Asked to explain why he would not introduce the legislation, Kitchens said it would not pass in the current legislative makeup, and he would not want to expend his political capital on a losing endeavor. The man then asked for a show of hands in the room for supporters of redistricting changes and got about a 75-percent response. “I’m not going to write that bill. It’s not a hill I want to die on right now,” Kitchens said. “It could be a brave move,” one woman said. “But it would be senseless,” Kitchens answered, saying you have to choose your battles. You can view the entire Sturgeon Bay listening session at doorbell.net.